Welcome to Miss He Bridal. We create made-to-measure bespoke bridal wear along with the award winning designer Allure Bridals. Based in North West England. If you’re looking for a wedding dress that fits like a glove, featuring exquisite quality, a sprinkling of Swarvoski Crystals or sensational lace appliques, then a wedding dress designed by Allure Bridals could be the one for you! Aside from the fact that Allure Bridals wedding dresses are designed using nothing but the best when it comes to quality and fabric, their gowns also feature a patented corset construction, allowing you the comfort factor on your wedding day, flattering your figure in every way. Allure Bridals: This collection is all about the details, beading, floral appliqués, dramatic backs, and perfect draping. Every gown features details to set it apart and make the bride shine. 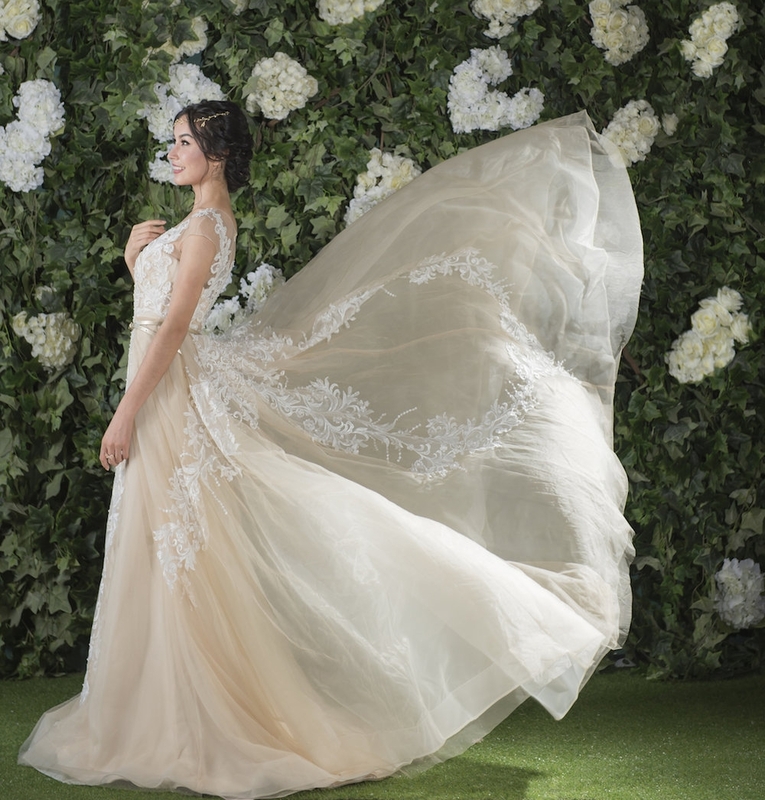 Allure Romance: Allure Romance is all about lace and ball gowns. We incorporated subtle silhouettes with soft, feminine element for a collection truly embodying its name: romance. Miss He Designs: Our very own collection of stunning gowns, bridesmaids, Flower Girl dresses all expertly designed by our very own Hebe Marsh He. Miss He Prom 2018 Dazzle at this years prom in long formal dress chosen from our very own collection in dozens of colours and material, all made-to-measure for a perfect fit. Rainbow Club Shoes From pointed courts to peep toes, to shimmery sandals to fabulous flats… Which Rainbow Club wedding shoes will you shine in on your special occasion? Did you know that our shoes can be hand coloured to any shade? Click on the Bespoke Colouring tab for more information. Formal Suit Hire Whether you are preparing for the biggest day of your life, planning your prom outfit or any special occasion, we have all the choice you need. Our boutique is open on Monday, Tuesday and Wednesday from 9:00am to 5:30pm, Thursday and Friday 9:00am to 7:00pm and Saturday 10:00am to 4:00pm. If you are travelling by car, there are plenty of parking spaces available. To get the most out of your bridal shopping experience, we advise to book an appointment where one of our stylists can prepare to welcome you and your party. Your appointment will last for approximately 90 minutes, and you are more than welcome to bring along any images or cut outs of dresses you may like. If you or your guests have any special requirements, feel free to give us a call and let us know, so that we can assist. To book an appointment or for further information, you can give us a call on 01942 233307, where one of our friendly members of staff will be able to assist you further.